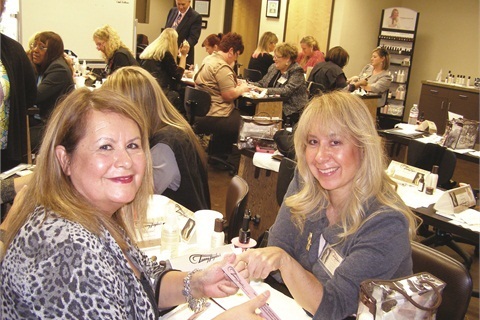 A nail instructor advises on when and why to bring a company representative into your classroom. I stand in front of my class for about eight hours a day. It’s only natural that students get used to the sound of my voice and occasionally zone out. But then someone else stands at the chalkboard, repeats exactly what I’ve already said…and this time, my students absorb the material. That’s one of the great things about bringing in a manufacturer’s educator. You may be concerned that a company representative who works directly for a product maker will be too focused on pushing one specific product to your students. But I’ve found that asking the right questions up front and bringing in companies for the correct reasons makes for an excellent lesson that sticks with pupils in the long run. > I invite manufacturers in to cover topics with which I’m not familiar. For instance if a student shows me a new find from a beauty supply store, and I’m not sure how to use it, that can be an ideal opportunity to bring in the manufacturer. In this case, I’ll take the class alongside my students — which means next time I can teach it on my own. > I call educators when I want to show students a different technique on familiar products. For instance, my students enjoy visits from Tammy Taylor Nails’ educators to learn different ways of sculpting with acrylic. > I request nail educators for reinforcement. For instance, Backscratchers’ educators regularly stop by to demonstrate fiberglass wraps. I know how to do wraps myself, and students get them in their kits. But sometimes it helps for students to see someone else do the service. > I welcome educators for diversity. I don’t want my students to be one-product oriented. I want them to try all sorts of stuff. > Many manufacturers require a minimum purchase to teach students. This is usually either a minimum number of kits or a dollar amount. > If you’re not happy with the required purchase, you can sometimes negotiate for a different product mix. Maybe they can substitute some of the liquid-and-powder for some nail tips. It generally doesn’t hurt to ask. Also, ask for the student price since it’s for your classroom. > I collect the money from my students first (one recent purchase came out to $35/student), then I schedule the appointment. The kits are shipped directly to the school. > In my classroom, you can’t just come in, do one demo, and leave. You’ll walk around my classroom, and you’ll help each and every one of my students. I let manufacturers know up front that their access to my students is contingent on the class being hands-on. > When I order the kits I ask: How much time you give me? Will you do both my morning and my afternoon class? Is this a hands-on class? Do you provide a certificate of completion once students have completed the class? With these tips, I think you’ll find manufacturers’ educators to be a valuable classroom resource. Madelyn Johnson is an instructor at Royal Beauty School in South Houston, Texas.